It is possible to be the perfect wife. Mustard is an antidote for poison! Success in life (or marriage) generally consists of finding the right regimen–and sticking to it. Many young Salem men drowned by falling overboard ships in exotic places, or in Salem Harbor. It is possible to illustrate the concept of division of labor many different ways using domestic items and tasks. Corset mania was a major concern–but for whom? Certainly not for Mrs. Sally Bott, who was the Miscellany’s most consistent advertiser. It’s nice to see this notice of the Salem Female Charitable Society, which was founded in 1801, incorporated in 1804, and is still in existence today! I’m off to London for Spring Break so will not be posting for a while, but I wanted to leave some links to some of the posts I’ve written on Salem women to fill in for me in my absence. It is Women’s History Month after all, and some of these ladies did not get the love and attention that I feel they deserved! Finding these ladies was an exercise that convinced me that I need to figure out how to develop an index for this compendium when I get back. I know London is not the typical Spring Break destination, but it is always my favorite destination: for this particular trip (on which I will be accompanied by students!!!!) I have the Botticelli Reimagined exhibition at the Victoria & Albert Museum on my agenda as well as Samuel Pepys: Plague, Fire and Revolution at the National Maritime Museum, and I really want to visit Sutton House in Hackney, as Tudor structures are relatively rare in London. Then all (or some) of the usual places. I know London pretty well but am open to suggestions (particularly for food–I never know where to eat) so comment away: I am not bringing my laptop but will check in with my phone. A Botticelli variation, a Pepys poster, and a drawing-room in Sutton House, Hackney. So here are some links that will lead you to Salem ladies, if you are so inclined. Despite years of blogging, I’ve hardly scratched the surface when it comes to interesting and notable Salem women, as I have sought to expose those whose stories don’t get told again and again and again. I seem to be drawn to artists, but there are lots of entrepreneurs and activists and just interesting women whom I have yet to “cover”–some men too! Colonial women: A Daring Woman; Ann Putnam; The Pardoning of Ann Pudeator; Four Loves; Minding the Farm. Authors: A Scribbling Woman from Salem; The Little Locksmith; Mary Harrod Northend; Mrs. Parker and the Colonial Revival in Salem (could also go under “artists”); Tedious Details. Artists: Painting Abigail and Apple Blossoms; Fidelia Rising; Miss Brooks Embellishes; Salem‘s Very Own Wallace Nutting;Paper Mansion. Uncategorized: The Mysterious Miss Hodges; A Salem Suffragette; The Woman who Lived in my House; Ladies of Salem; A Salem Murder Mystery; The Hawthorne Diaries; Factory Girls and Boys; Little Folks and Black Cats; Bicycle Girls. 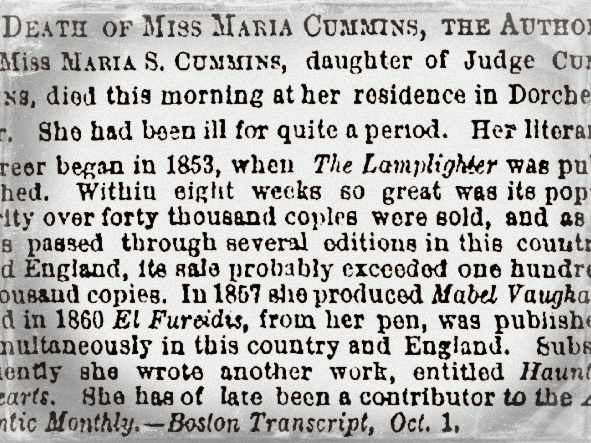 Two Salem-born authors competed for best-seller status in the 1850s, but it wasn’t really much of a competition: Miss Maria Cummins’s Dickensian novel The Lamplighter: or An Orphan Girl’s Struggles and Triumphs (1854) far outpaced Mr. Nathaniel Hawthorne’s The Scarlet Letter (1850) and The House of the Seven Gables (1851) in this decade, and after. 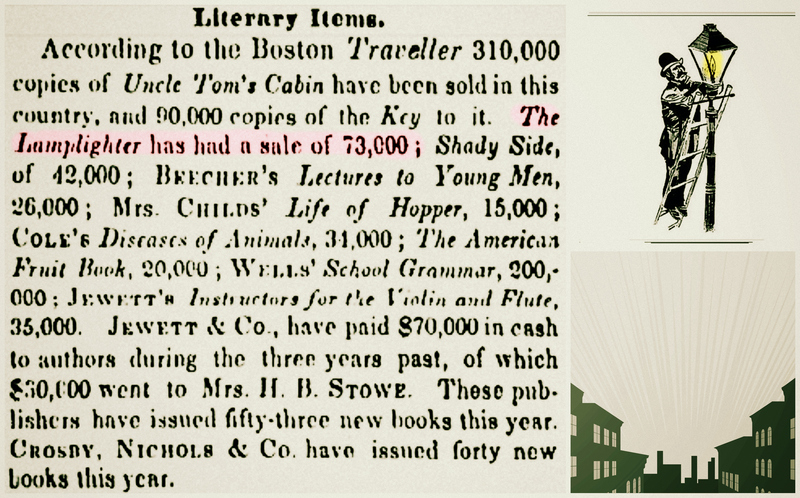 Hawthorne’s classics did well in their first year of publication–selling over 6000 copies each–but 73,000 copies of the more ephemeral Lamplighter were purchased in the first year of its appearance, second only to a book penned by another female author from the same publishing house, Harriet Beecher Stowe’s Uncle Tom’s Cabin. These successes prompted the penning of a famous letter to his own publisher, William Ticknor, by a petulant Hawthorne in 1855 in which he complained that “America is now wholly given over to a d——d mob of scribbling women” and “I should have not chance of success while the public taste is occupied with their trash–and should be ashamed of myself if I did succeed. 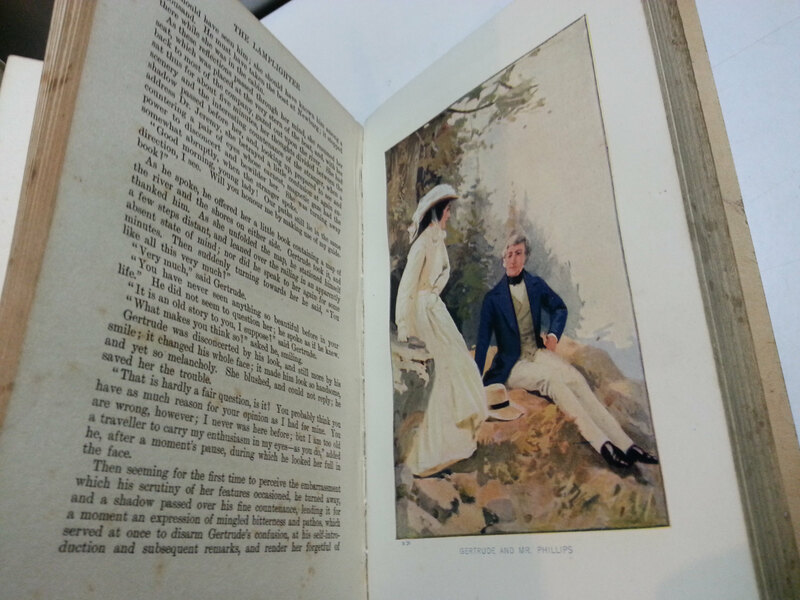 What is the mystery of these innumerable editions of the Lamplighter, and other books neither better nor worse–worse they could not be, and better they need not be, when they sell by the 100,000.” I don’t think Hawthorne is merely venting to his publisher, but also prodding him to be a bit more marketing-minded, as Cummins’s and Stowe’s more enterprising publisher, John P. Jewett of Boston, issued their works in multiple editions and formats for diverse audiences. 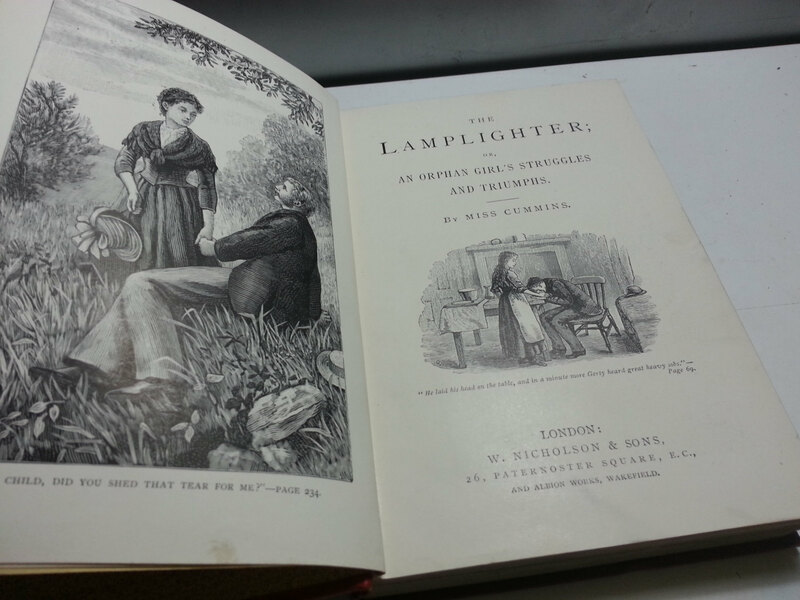 All the editions of The Lamplighter that I have seen are rather lavishly illustrated, and there were also “tie-in” products like musical compositions and picture books. The protagonist of The Lamplighter, the orphan Gerty Flint, consequently becomes rather famous while her creator remains quite literally anonymous: Cummins published three more books (by “the author of The Lamplighter”) before her premature death at the age of 39 in 1866: only in later editions does her name appear on the title page. 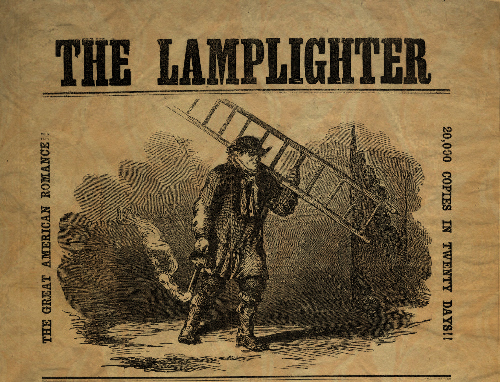 I’m not really a fan of this sort of sentimental fiction, but I’ve tried to read The Lamplighter a few times without much success: the prose stopped me once, and then I found out what would eventually happen to little Gerty’s kitten and I just didn’t want to go there…………. 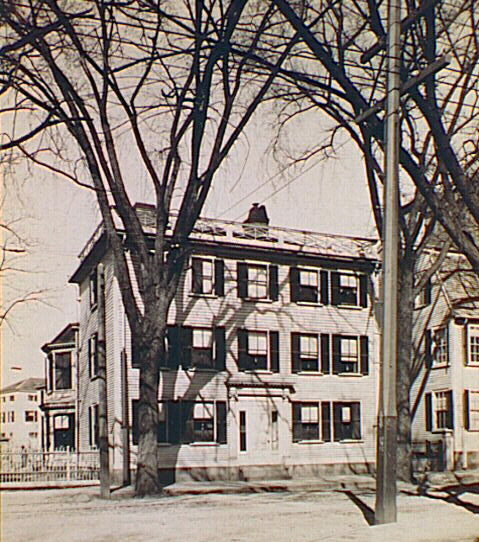 Frank Cousins photograph of the Samuel Curwen House, the birthplace of Maria Susanna Cousins, formerly at 312 Essex Street and moved to North Street in 1944 (it is now home to Historic Salem, Inc.); broadside advertising The Lamplighter from the John P. Jewett Company of Boston, 1854, and two musical tie-ins from the same year, Library of Congress; Sales figures for 1854 from The New York Times, December 20, 1854; 1884 and 1914 editions from 1884 and 1914, La Maiden en Noire; Miss Cummins’s obituary from the New York Times, 1866.